Goodness me, it’s Blooms Day, October ’09 in T.O. 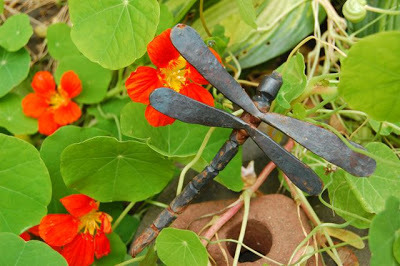 The about-to-be-felled-by-frost ‘Paintbox’ nasturtiums (Tropaeolum majus), still oh-so-orange and still going strong. Almost missed it with all the fuss and bother lately ’round these hyar parts. And it’s a suddenly wintery October 15, 2009. Tomorrow might be a whole n’other post-brrrrrrrr story. So here’s what has been dodging frosty bullets chez nous mid-month. Corydalis lutea has been in bloom constantly since late May, though now a little more modestly. A few sweet buds of the Rosa ‘New Dawn’ which has been known to put out blooms as late as November. 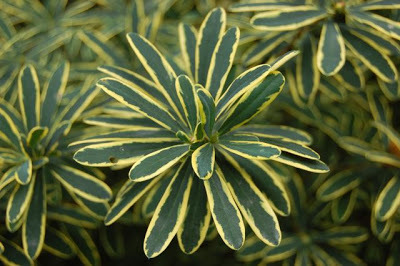 The lusty Daphne ‘Carol Mackie’ foliage and its hidden buds with their promise of a good show of fragrant bloom next May. 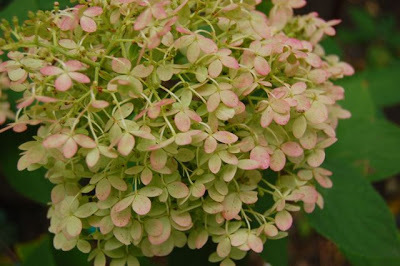 And, in the front, the new Hydrangea ‘Limelight’ starting to show a blush of pink. There’s not much more to tell. A surprise Easter lily still in bloom. A Fuchsia ‘Gartenmeister’ coming back into bloom… a little too late. Also in containers, some ‘Happy Thoughts’ pelargoniums that I hope to rescue via cuttings, along with a reverse-striped spider plant (Chlorophytum comosum). Spider plants are said to be one of the best for indoor air quality… plus they’re super simple to care for. Better get them inside, as the wind is picking up! 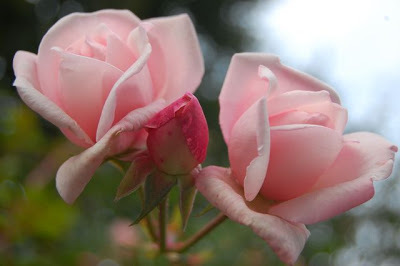 To see and/or drool over what’s still in bloom in other parts of the world this October, visit May Dreams Gardens where on the 15th of each month Carol graciously makes it easy for garden bloggers around the planet to share and compare. Corydalis lutea is a spring bloomer here. 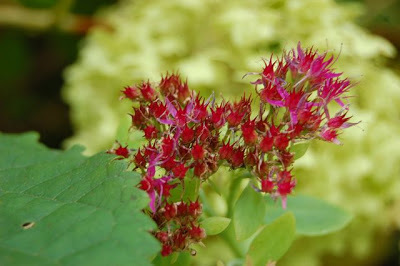 It comes up, blooms with the daffodils and then melts in the heat and humidity of late spring. It will come back with the daffodils. Fortunately lantana puts out growth in time to continue the yellow show. Love the nasturtiums; another spring bloomer for us. Happy Bloom Day. 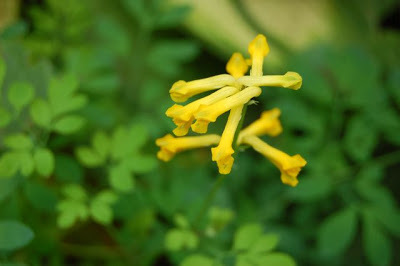 Corydalis lutea only bloomed in spring for me this year–but it was its first spring here. I have it in moist shade. I wonder if it would bloom more if in a sunnier position. Where do you grow it? Go with the snow. It’s a good thing. Shabana on Want to win the Gardener’s Gratitude Journal? Randie on Want to win the Gardener’s Gratitude Journal? Annie Brelih on Want to win the Gardener’s Gratitude Journal? 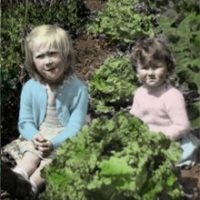 Joy Cullen on Want to win the Gardener’s Gratitude Journal? Linda on Want to win the Gardener’s Gratitude Journal?